"Hey, did somebody lose a nose ring?" "There is a nose ring. Where is it?" The above conversation follow's the band's derailed first attempt at "The Karfluki Set". The derailed attempt's musical shortcomings contrast with the second attempt's musical perfection. The conversation offers a comical interlude before the band lays down the notes to one of their most masterful recorded instrumental jams. "The Karfluki Set" is just one of the fine songs on their 1997 CD release The Gravel Walk. 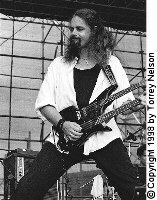 Tempest formed back in 1988 with Lief Sorbye (lead vocals, electric & acoustic mandolins, tin whistle, flute), Rob Wullenjohn (electric guitar, vocals), Mark Showalter (bass), and Adolfo Lazo (drums). 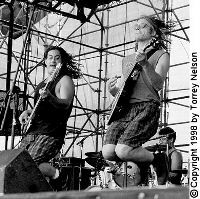 In 1990 Ian Butler replaced Mark Showalter on bass. 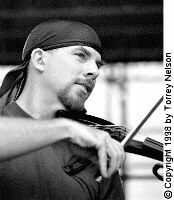 In 1992 Michael Mullen joined Tempest to play fiddle. 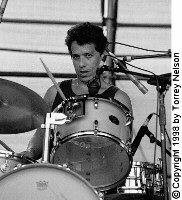 In 1993 Michael Mullen left the band and was replaced by Jon Berger. In 1995 Michael Mullen returned to replace Jon Berger. Before the return of Mullen though, Ian Butler was replaced by John "Jay" Nania. More recently, after the recording of the Gravel Walk CD, John Land replaced Nania on bass and Dave Parnall replaced Rob Wullenjohn on electric guitar. Lief Sorbye and Michael Mullen also play in a band called Caliban. Caliban is a two man group for small settings and features stylings similar to Tempest. Sorbye plays octave mandola and Mullen plays fiddle. In short, Tempest plays Celtic rock. Short descriptions are rarely accurate. In more descriptive terms, Tempest plays an electrified, sometimes fast, many times graceful folk rock. Often it is all those things at once. Their folk themes trace from many places such as Scotland, Ireland, and Norway. Both their recordings and live shows are outstanding. Read and write reviews at Amazon.com!